Not convinced? 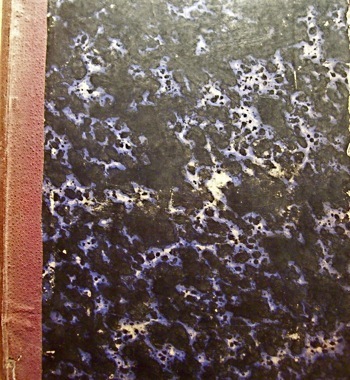 All right: I admit that the front cover alone isn’t the most exciting thing you’ll have seen on the Internet today. 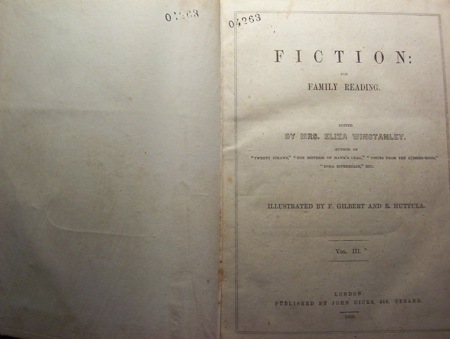 This little octavo is volumes three and four of Fiction for Family Reading , the obscure and short-lived mid-Victorian journal edited by Eliza Winstanley. Now I bet you’re excited. I found this in Barcelona—thanks to the magic of the Internet, obviously, although I will now add “shopping for rare Victorian books in Spain” to my list of things to do—a month or so ago, and inveigled Nick into allowing me to put it on his credit card. And it arrived this afternoon, accompanied by a courier with whom I had a brief but interesting conversation of the futility of having a doorbell when said doorbell doesn’t actually work. I really must put a sign up. 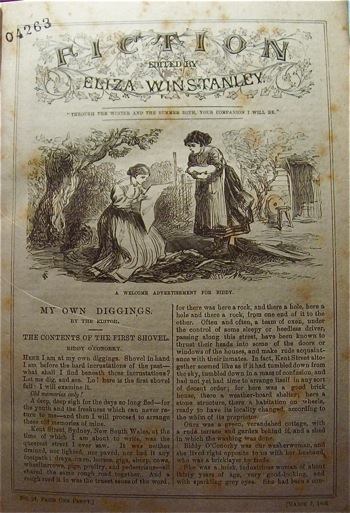 These volumes include all installments of Winstanley’s longest work for the journal: “My Own Diggings,” a series of discrete stories about Australia during the convict era, linked by a single narrator who plays a more or less active role in the various events. So obscure is this journal that when I was working on it myself, I had to work from a set of microfilms (very generously purchased by the library) made from the British Library’s copy, because I could not locate a single copy in an accessible library anywhere in Australia and the run hadn’t been previously microfilmed. The only drawback to this glorious little book is that this neither of these volumes includes the rewriting of Hans Christian Andersen’s “The Travelling Companion” that was curiously accompanied by an illustration of a half-naked woman. This post is partly ironic (at least, that was the intention): I don’t really expect anyone else to get particularly excited about it. But I’m excited: this book hits all my specifically geeky buttons. Re: doorbell. Your sign should say, a la Owl in Winnie the Pooh, “please knock if an answer is required; please ring if an answer is not required”. You might need to look up Owl’s idiosyncratic spelling, but the closer the better. Now that would have the dual advantage of being really helpful for future couriers and giving me massive street cred. I shall do it!